All GTA members , 3 MLA , Chairman / Vice Chairman and all councillors or 4 Municipalities, Representatives of 4 GJM Sub-divisions , GJM Student Union, All Assam Gorkha Student Union, All Manipur Gorkha Student's Union, GJM Delhi and Haryana Units were present in the Dharna. The Dharna will continue till 19th March and I would join them soon. I would appeal to the entire Gorkha Community living in and around Delhi to take part in this Dharna for Gorkhaland. 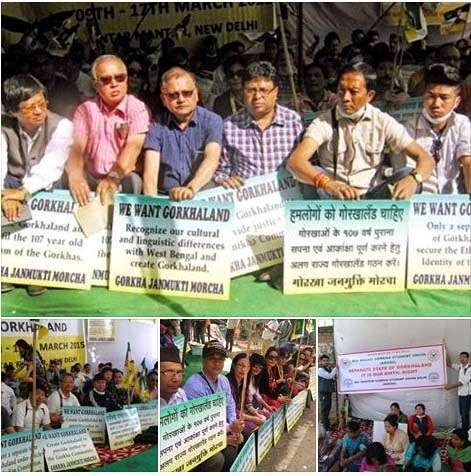 The 1st Day of ongoing "Dharna for Gorkhaland" which is organized by the Gorkha Janmukti Morcha has seen good participation from Morcha supporters and office bearers from across the Darjeeling region. All the three MLAs from Darjeeling, and Chairmen/Chairwomen of Darjeeling, Kurseong and Kalimpong Municipalities, along with various office bearers of GJM frontal organizations such as Nari Morcha, Yuva Morcha, Vidhyarthi Morcha are in participation. Senior GJM leaders such as General Secretary Roshan Giri and Binoy Tamang are also in attendance. The dharna will continue till March 17 and GJM has extended welcome to anyone willing to join the cause.